Foot massage. It feels so good. Our feet are often forgotten. We do carry a lot of stress in our feet, but really, few of us would notice. Yet when we get a foot massage, it feels so good that it can relax our whole body. When you give yourself a foot massage, you don’t need any special supplies at all. However, many people like to use a massage oil because they can stroke their skin without pulling. If you like oil, try a pure vegetable oil like sweet almond or jojoba. Even olive oil will do in a pinch. Add a few drops of essential oils–try lavender or geranium–to make it especially nice. Be sure to rub all of it in so you don’t slip. An alternative to oil is lotion. As a lubricant for massage, lotions are perfectly fine. However, I encourage you to read the label. You will probably be surprised at the chemical list! Pre-made lotions and oils often smelll nice and have a nice consistency, but it is at a cost to your health. If you love your lotion, use it. If you can make a change, change to something more pure and natural. Some people do not like to have their feet “slimed up” with oil. If you still would like something to smooth over your skin, try corn starch or cornmeal. Corn starch feels soft and slick. Corn meal gives a little extra zing from the coarseness, like walking on a sandy beach. An added bonus is that it exfoliates as well. Either is a good alternative to oil. 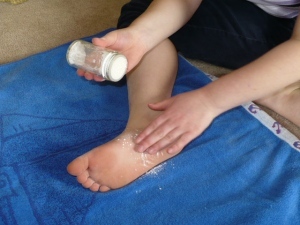 To use cornmeal in a foot massage, place a towel on the floor to collect the mess. Find some container which is roughly foot sized. Pour some cornmeal in and start massaging. For added pleasure, heat the cornmeal in the oven before using. And for even more luxury, put a couple of drops of essential oils in the corn meal and mix. To use cornstarch, put the cornstarch in a shaker and shake! Finally, sometimes it is nice to special massage toys to pamper your feet. One of the simplest is a tennis ball. You can stand on it and roll it around. Don’t forget to focus on the arches. The next step is the fun part. 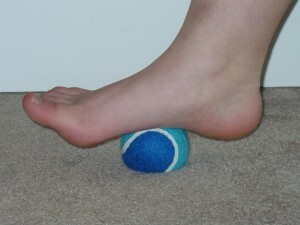 Move on to “Part 2: Techniques to Massage Your Foot” to find out some nice spots that have you sighing “Ahhh” after a hard day. When you can’t be massaged by someone else, the Body Back Buddy is a great tool. 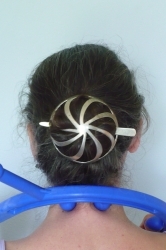 You can use it to reach your back and relax tight muscles for great stress relief. Massage is great for stress relief. But sometimes it is difficult to get a massage. When your muscles feel so tight that you can hardly move your head, and your head is pounding with a stress headache, the Back Buddy can provide stress relief. You can apply pressure to the tender spots in your muscles and relieve the tension. What is a Back Buddy? The Body Back Buddy is made for direct pressure on points that are tender and sore. It is not easy to rub or stroke with it. You apply pressure and then move to the next spot. 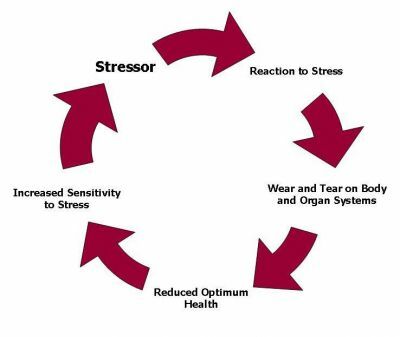 When pressure is applied to these sore spots, the muscle releases and there is relief from the pain. The Back Buddy is made of very hard plastic. It is not “comforting”, and can even be painful if you use too much pressure. This makes it excellent for applying pressure to sore spots until they release. It is not good for a massage that is soothing and soft. You could solve problem by putting some padding on the knobs, but it is made for pressure. There are many different knobs which can give you a great deal of uses. Use your imagination and you can figure out lots of ways to massage your body. You can use the “S” shape in many angles. The “S” gives great leverage and you can easily reach difficult places with little strain on your hands, wrists or arms. The BBB comes in 3 sizes for small, medium and large people. The use of the BBB is limited only by your imagination. In general, you are looking for sore, tight spots and applying gentle but firm pressure for 10-30 seconds until the muscle relaxes. Using the Back Buddy (affiliate link) on your upper back is easy. You can reach 2 spots at once with the double knobs. 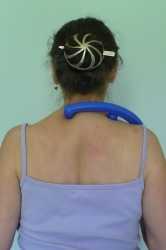 The can be positioned right by your cervicals or nearer your upper trapezius. Use the double knobs to get right below your shoulder blades. You can easily get your outer thigh without tiring your fingers. This is a very interesting technique. You get both outer shins at once, and the pressure is increased or decreased by spreading your legs and pushing against the knobs. You can use the Back Buddy while lying down. It’s easy to reach your feet and get really good pressure on them. If your neck is screaming in pain, a massage is a nice solution. But if you can’t get a massage, try this nifty massager. 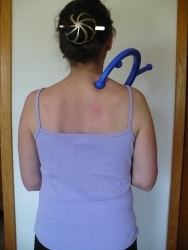 The Body Back Buddy (affiliate link) is great for giving pressure to your back and neck muscles. It is not a soothing treatment. Think of it as therapeutic pain relief.